The Trump Administration is proposing a major expansion of offshore oil leasing nationwide, including off the California Coast. It would be the first West Coast oil lease sale since the 1980s, but that doesn’t mean it’s a done deal. State and local officials could easily throw a wrench in the plans. The Department of the Interior is proposing lease sales from Northern to Southern California beginning in 2020, as well as in Alaska and on the Atlantic Coast. Exactly where those oil leases are would be determined later in the planning process. West Coast elected officials were quick to condemn the plan. 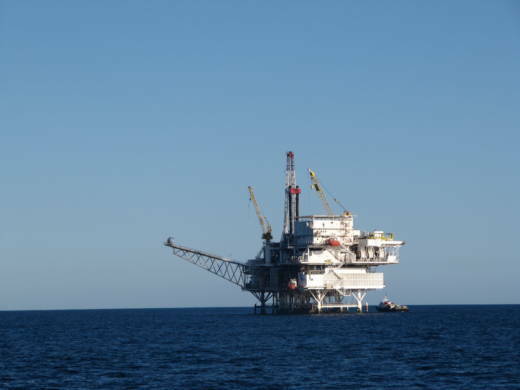 The leases would be offered in federal waters, which begin three miles offshore and extend to 200 miles offshore. But oil companies must bring that oil onshore to refine and sell it. That’s where they run into state and local jurisdictions. During the last federal push to open up oil drilling in the 1980s, the City of Santa Cruz passed a measure that banned new onshore oil facilities, including pipelines, unless it went to a public vote. Many other California cities and counties followed suit, including Sonoma, San Mateo, Monterey and San Luis Obispo Counties. These “onshore facilities” ordinances survived a legal challenge from an oil industry association in 1990. California has banned offshore oil drilling in state waters, which extend from the coastline to three miles offshore. But state legislators are looking at taking it a step farther. State Senator Hannah-Beth Jackson (D-Santa Barbara) is introducing SB 834, which would ban new pipelines, piers, wharves, or other infrastructure that would go through state waters. A similar bill died in committee last year. A companion bill, AB 1775, is being introduced by Assemblymember Al Muratsuchi (D-Torrance). That could dissuade oil companies from buying oil leases. Without a pipeline to bring oil onshore, oil companies would have to turn to other means, like using ships for transport, which is generally seen as riskier and more expensive. The State Lands Commission, which has jurisdiction over state waters, has already adopted a resolution that directs staff “to take appropriate actions to ensure that any oil and gas product from new drilling never makes landfall in California,” according to commission chair Lieutenant Governor Gavin Newsom. Economics is perhaps the largest factor in determining whether new oil rigs appear off the California coast. Oil prices have been low and offshore drilling is generally much more expensive than exploration on land. Still, oil industry groups applauded the Administration’s drilling push. “This new offshore leasing plan is an important step towards harnessing our nation’s energy potential for the benefit of American energy consumers,” said the American Petroleum Institute’s Erik Milito in a statement. In comments to the Department of the Interior, Chevron expressed interest in opening the Pacific Coast for leasing, but ranked Southern California as seventh on their priority list, after regions in the Gulf and Atlantic. “Our priorities in offshore exploration are in the Gulf of Mexico and understanding the potential of the Atlantic waters off the East Coast,” Chevron said in an email. Still, many environmental groups believe that today’s oil prices wouldn’t stop oil companies from speculating on leases now and waiting for the conditions to change. The Trump Administration’s plan could take up to two years to finalize with the first leases being offered in California in 2020. The public comment period opens on January 8 and the Department of the Interior will hold a meeting in Sacramento on February 8.